The Orange Monster is so cool, it's scary! It has an orange face that gets noticed. 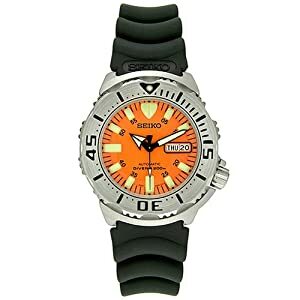 This is a dive watch that is very cool and different. The bezel rotates in only one direction, which is normal for a diving watch, and big 'scallops' are cut out of the bezel so it's easier to grab onto. The large screw-in crown occupies the 4 position (vs. the standard 3 position) to keep it from rubbing on the wrist. Large, luminous hour markers and hands make it easy to read in darkness or sunlight. It comes equipped with a tough but comfortable black rubber band that makes it look even cooler. This watch is a cool guy gift that he is certain to love.